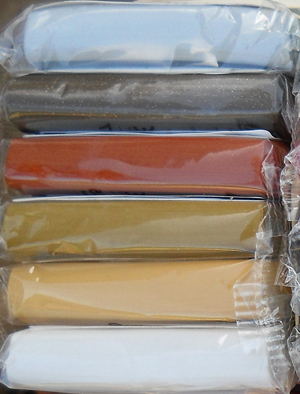 Cernit Clay Glamor and Metallic colors - High quality oven bake polymer clay -Cernit Clay modeling material comes in a wide variety of colors. The backround image in each box is a picture of the actual clay color out of the package. Images are only a likeness of the color and may not be exactly the same when you have it in your hands and are looking at it. Discontinued. Limited to supplies on hand. This color is now in the Metallic range. Although the images below show 18 glamor colors, there are only 12 now. The metallic looking colors in the top row are now in the New Metallic color line. They are awesome! 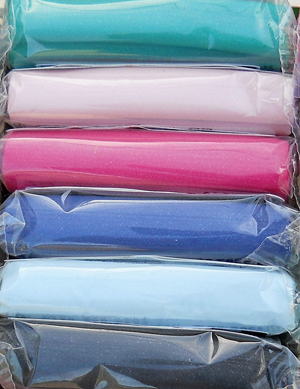 The following colors are no longer available in the glamor color line. The colors below are available for as long as supplies last.